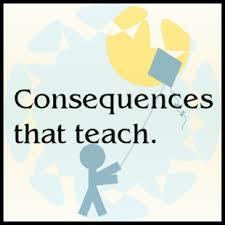 Consequences are there to help children understand and learn that their behaviour is wrong. They only work if they help to ensure that the behaviour is less likely to happen again. When children make mistakes or behave in a way that parents don’t like, it’s more useful to regard this as a ‘teachable’ moment rather then trying to make the child suffer. Then they end up feeling resentful but no learning or real change in behaviour takes place. Please see video below for an explanation of ‘teaching’ consequences. What parents really want is to have a child who is morally responsible and on the whole wants to do the ‘right thing’. Not because they fear their parent or teacher’s reaction or they are trying to avoid getting into trouble but because they feel responsible for their actions. The problem with using fear and punishment as a way of responding to behaviour is that it usually makes children feel angry, rebellious and resentful. The child is not necessarily thinking about what they have done wrong but becomes very focused on how ‘unfair’ the punishment is and is only worrying about not getting caught again in the future. More importantly, punishments can damage the parent-child relationship. In order to really influence your child over time, encourage more co-operation and motivate them to do the right thing, there needs to be a strong and connected relationship between parent and child. The word ‘discipline’ actually means to teach. However, once a child has been punished parents usually find that the child’s behaviour doesn’t change or improve. In which case they haven’t really been ‘disciplined’. Parents often feel that if they don’t respond to ‘misbehaviour’ there is a sense that the child is ‘getting away with it’. Of course I don’t think children should be able to do whatever they want but as a passionate advocate of ‘positive parenting’ there are ways of responding that help parents to stay connected with their children and teach them to see the consequences of their actions so they can choose whether to repeat them. 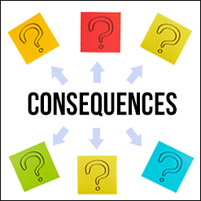 Please see video below for an explanation of ‘natural consequences’ so children experience what happens as a result of their choices. Parents are not criticising, blaming or telling the child off but they are also not rescuing them.